We’re nearing the end now. Only one more restaurant after this write-up of Fabio Trabocchi’s Sfoglina, and, for me, 2018 Winter Restaurant Weeks come to an end. 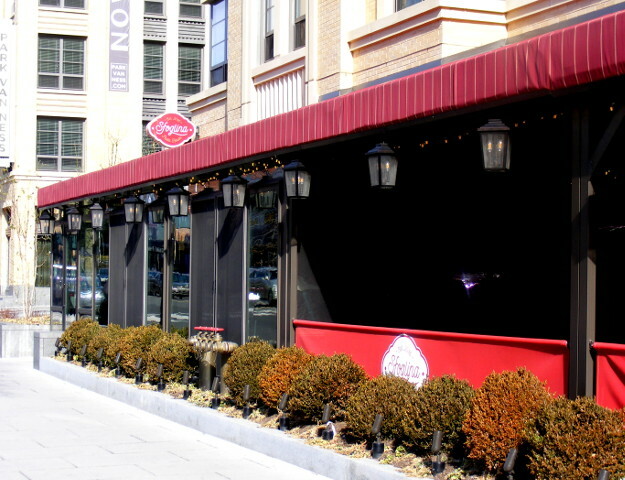 Trabocchi and his wife own five highly-rated DC restaurants. Fiola has a Michelin star, and Sfoglina was just added to Michelin’s DC Bib Gourmand list for 2018. 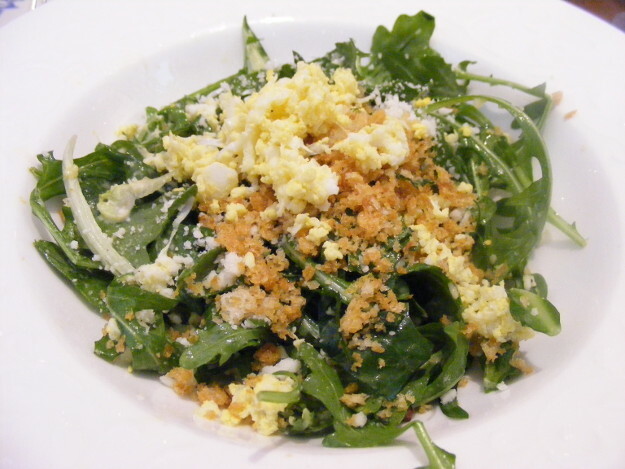 This is Sfoglina’s take on a puntarelle and arugula Caesar Salad. 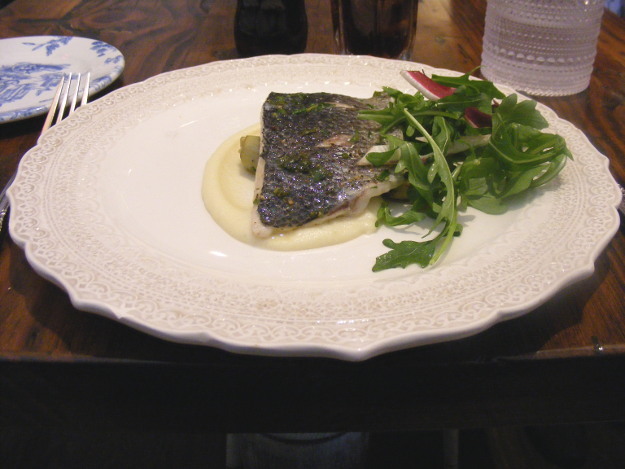 A small serving of sea bass, with Roman artichokes and a parsnip purée. 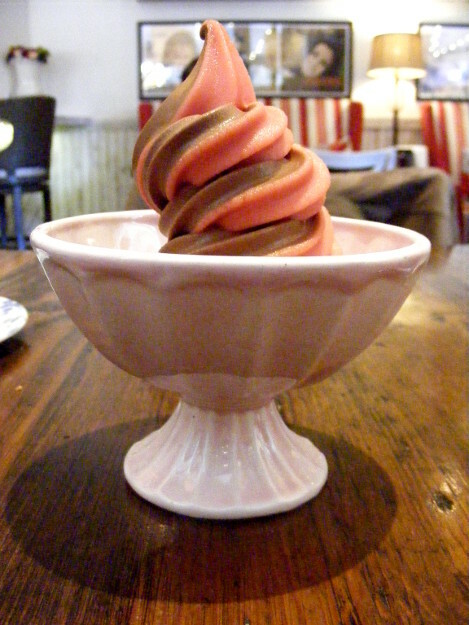 This was listed as a Soft Serve of Blood Orange and Chocolate. Perhaps the size was meant to compensate for the meagreness of the starter and the main. The food was good and the service was excellent, but I left unhappy. It wasn’t just the serving sizes that disappointed, it was something on the bill. I don’t drink wine at lunch, and ordered a Diet Coke, which the server poured from an eight-ounce bottle. When I got the check, I saw that I’d been billed $6 for the drink. I know that restaurants make much of their money from the inflated charges for drinks, but at the CVS a block away from the restaurant, 64-ounce bottles of Diet Coke were on sale at $1.66 each. If my math is correct, the markup here is about 2,890%, which is outrageous. If you’re wondering whatever happened to the notorious pharmadouche Martin Shrkeli, he may have been hired to set prices at Sfoglina. It was a sour note, and it left a bad taste in my mouth. This entry was posted in Restaurants and tagged 2018 Winter Restaurant Week, Lunch, Sfoglina, Upper Northwest on 2 February 2018 by bcarter3.